A man was thrown down a flight of stairs in a bar attack, breaking his back. Bradley Aspin, 21, was attacked by Jermaine Allen, 30, who had travelled from Bradford in West Yorkshire for a night out in Newcastle. Mr Aspin, from Teesside, was knocked unconscious in the fall and had to wear a brace for five months. Allen was convicted of grievous bodily harm and jailed for four years and six months. The pair had got into an argument in the House of Smith bar in September 2017. Mr Aspin was taken to hospital while Allen carried on with his night out. When police arrived, Allen lashed out and managed to escape. Officers eventually managed to trace him back to Brindle Close, Bradford, in January. After the trial at Newcastle Crown Court, Mr Aspin said the attack had "massively, massively" changed his life. He added: "I am always looking over my shoulder and I don't go out drinking as much as I did because I don't want that to happen again." Mr Aspin, a customer services worker, thanked police and said his injuries had stopped him going to the gym and playing football. 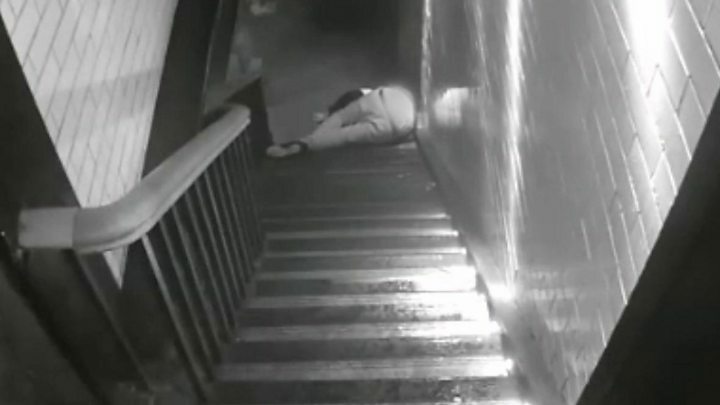 Sgt Andy Percival, of Northumbria Police, said: "You can clearly see on the CCTV that Allen struck his victim multiple times before forcing him down the stairs and he knew that his actions would cause serious injury."